HOUSTON — An appearance by former President Obama here last night wasn't focused on energy and climate change, but he made a point of mentioning accomplishments tied to both. "I was extraordinarily proud of the Paris accords," Obama told Jon Meacham, the historian who moderated a discussion between the 44th president and former Secretary of State James Baker. Obama's statement came nearly three years after a global climate agreement was reached in France, less than two years after President Trump announced his administration's plan to leave that deal and just days after a new U.S. report warned of potential economic damage from climate change. Obama drew some applause with his Paris comment, but he shifted quickly to fossil fuels. "I know we're in oil country, and we need American energy," Obama said. The former president referenced rising energy output under his watch and sudden talk of America's leading role in oil and gas production. "That was me, people," he said, eliciting cheers. Obama said it was like going to Wall Street and hearing people grumble about "anti-business." "I said, 'Have you checked where your stocks were when I came into office and where they are now?'" Obama said, adding, "'What are you complaining about? Just say thank you, please.'" Obama's appearance, which was webcast, came as part of a 25th anniversary celebration for Rice University's Baker Institute for Public Policy. It was a chance to see a former Democratic president and a longtime Republican voice on the same stage. Meacham said what brings Baker, Obama and the country together is "a shared sense that we have to push forward to a more perfect union." 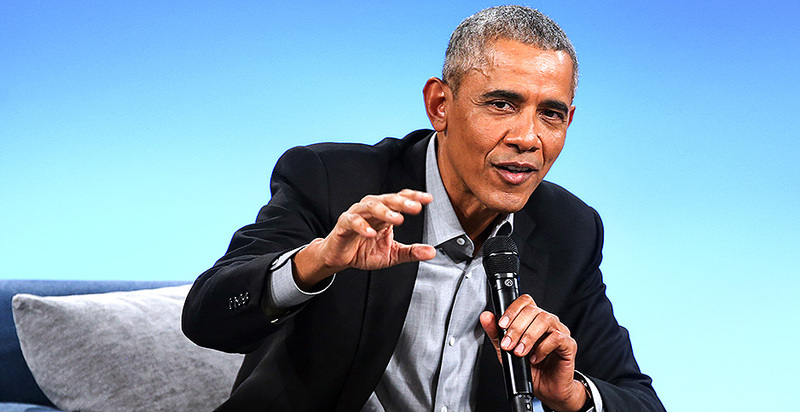 Obama sharply criticized Trump in appearances leading up to this year's midterm election, and Trump's administration loomed over last night's discussion even as he went largely unnamed. Meacham made an indirect reference when he appeared to compare Trump to Voldemort, the enemy of Harry Potter. Last night, Baker, who served as Treasury secretary under President Reagan, spoke of efforts by Reagan to work with then-House Speaker Tip O'Neill (D-Mass.) to find ways to get things done despite policy differences. Obama talked about media trends, saying there used to be a common set of facts that both parties had to adapt and respond to. He said that was increasingly different by the time he took office. "If you are a Fox News viewer, you have an entirely different reality than if you are a New York Times reader," Obama said. That means there are more ideological party bases, he said, and gerrymandering of districts means members of Congress have to worry about primary challenges and aren't willing to stray from the party line. The former president referred to Texas as a champion of gerrymandering but said both parties do it. Congress has had "difficulty getting out of campaign mode and into governance mode," Obama said. He said members of Congress are motivated primarily around keeping their seats. "Folks are running scared all the time," Obama said, and "the ability to step back and reflect, to compromise is reduced." Obama described gerrymandering as a solvable problem with the potential use of nonpartisan commissions, while he said trends related to technology and globalization probably won't reverse anytime soon. 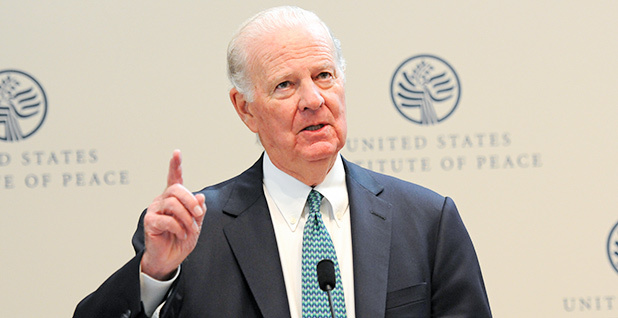 "The responsible center in American politics has disappeared," Baker said last night, citing factors such as safe districts and the role of the internet in being divisive. He also said the media "are no longer objective reporters of the facts." While there wasn't a focus on climate change last night, Baker has talked about a need to address carbon emissions. In April, he used an appearance in Houston to discuss a previously floated carbon dividends plan and said it could be a way to overcome a partisan split over climate policy (Energywire, April 18). The plan includes a carbon tax and aims to reduce greenhouse gas emissions and some regulation. Baker said in April that he had "serious doubts about exactly what effect man-made emissions may be having on the climate." But he said the future effects of a changing climate were marked by uncertainty, and he called for prudent measures to limit the scale of potential damage. Last night, Obama said one thing that surprised him about the presidency was the "degree to which the United States underwrites the international order." He said people call Washington if there's a problem around the world. With dysfunction, Obama suggested, there are opportunities for disorder to rise in the world that can make the country less safe and less prosperous. Baker said American leadership in the world is imperative. He said institutions such has the International Monetary Fund, the United Nations and NATO make America stronger, even though some reforms may be needed and European allies need to pay their way. Obama said work over 60 or 70 years helped build a wealthier world that's healthier, more tolerant and more democratic. But he said a consensus under various U.S. administrations in recent decades didn't fully address issues related to closing factories and a widening gap between pay for a CEO and someone on an assembly line. "We did not adapt quickly enough to the fact that there were people being left behind and that frustrations were going to flare up," Obama said. In such environments, he said, there can be politics based on nationalism tied to hatred for someone on the other side of a border. Baker said he was proud to have left Washington unindicted. Obama shared that sentiment and said his family came out intact from the presidency. "Not only did I not get indicted, nobody in my administration got indicted," Obama said. The former president labeled the Affordable Care Act as important and incomplete. Obama called it a "starter house" on a path to a "smarter, more rational health care system." He also discussed the transition that former President George W. Bush's administration put in place. And Obama recalled walking into the Oval Office. "There's a reverence there for that office," Obama said, "that is independent of you. And if you don't feel that, then you shouldn't be there."